Welcome to Club Kosher’s “Passover in Paradise: A Culinary Adventure” with a dream team, all-star lineup of some of the best kosher chefs in the world. Our well rounded program has daily cultural programs and nightly entertainment, and as many activities as you can handle. The toughest decision you'll have at Club Kosher is whether to participate in one of our planned activities or just relax by the pool or beach. 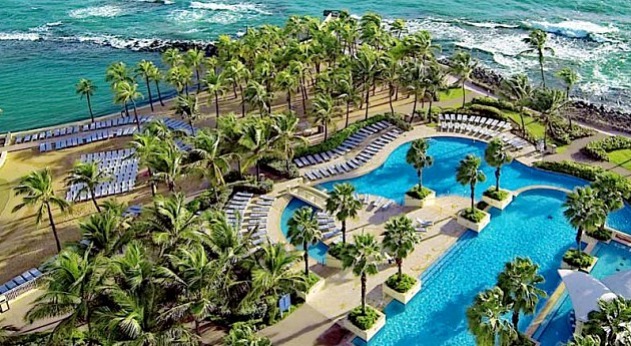 Experience the 5 star, 4 diamond elegance of Puerto Rico’s iconic Caribe Hilton. The Resort overlooks the sparkling Caribbean while our attentive staff overlooks nothing, making it easy to understand why both property and program are known for “service” as much as destination. Secluded beach - one of the most scenic beaches in the Caribbean. Custom crafted “inside, poolside & Oceanside” dining experiences, created by our top chefs and the gourmet culinary staff. Private, Family & Communal Seders available. Lavish and specifically designed tearoom. Full spa- hidden within the soothing breeze of the Caribbean, the dancing swing of the palm trees and the serene sounds of the sea waves. 17 acres of tropically landscaped peninsula. Discover Old San Juan- just a short trip from the Caribe Hilton, where history and art harmonize with endless gardens, caves and stunning beaches. Family-friendly films festivals in the hotel’s movie theater. Restaurant-like experience in every meal. Stimulating lectures and talks from world renowned speakers from the world of politics, food, religion, etc. Club Kosher is committed to providing each guest the utmost in quality service and personal care. We'll pamper you with attentive service and we'll relax you with the finest luxurious accommodations. From the very moment you decide to join us until you arrive home safely, we will always be there to assist you. From our tour directors, who will greet you at the airport and at your destination, to our customer service department, we take care of all the details for you. At Club Kosher entertainment isn't an afterthought whose main role is to act as a marketing tool to fill space in ads and literature... It's a key part of the program, where every act is chosen for its ability to add dimension to the day and make an already memorable moment even more memorable. Kids have their own game room and playground. Activities include pool games, camping, t-shirt painting, balloon art, and costume and magic workshops. An arcade with video and electronic games will be available for teenagers. And these chefs are not just pretty faces we're put down on the brochure. They are going to be on the program working, schmoozing, educating and swimming, with all of us. We're going to have demos, roundtable discussions, and tons of foodie fun. In short, be sure to pack your appetite, because signature Club Kosher is about proving that inspired quality can exist in impressive quantities. From Ashkenaz & Sephardic favorites to Asian-inspired fusion, al-fresco breakfasts to pool-side barbecues, buffets and brunches, to tempting kiddushim and themed tea rooms, our Club Kosher crew have one goal- to provide you the best Pesach you will ever have! Nachum Segal, well known Jewish radio host and personality of JM in the AM for over 20 years.